Automate your workflow and reduce your client onboarding time, by integrating Practice Ignition and Karbon. 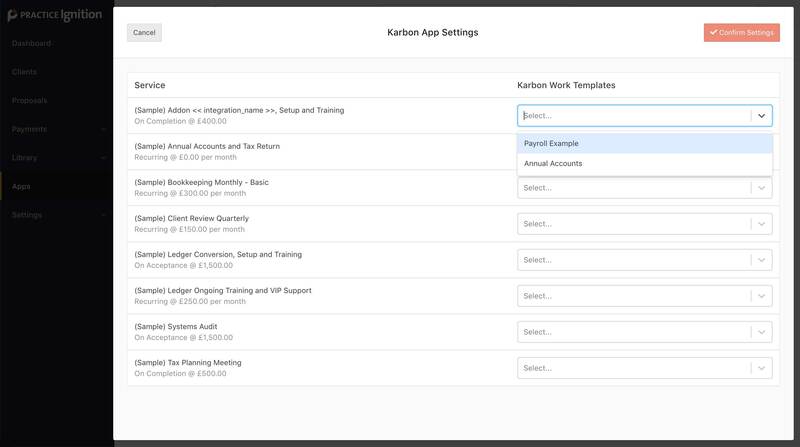 By integrating Practice Ignition with Karbon, you can automatically trigger a work item to be created from your chosen template when a client accepts a Practice Ignition proposal. 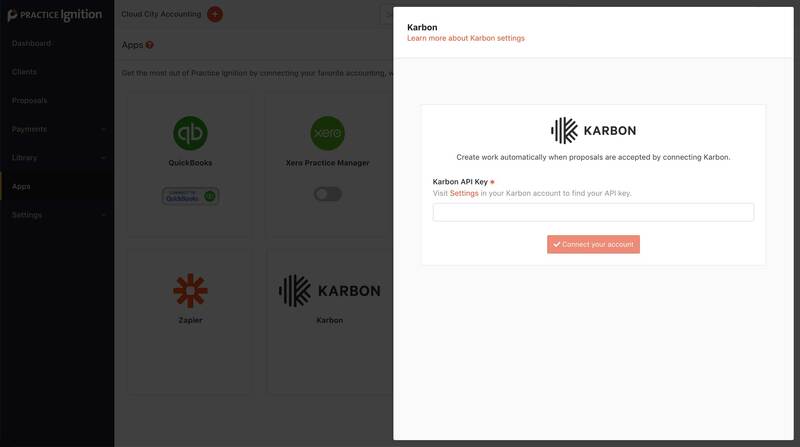 This guide will walk you through the steps to connect your Practice Ignition account to Karbon. 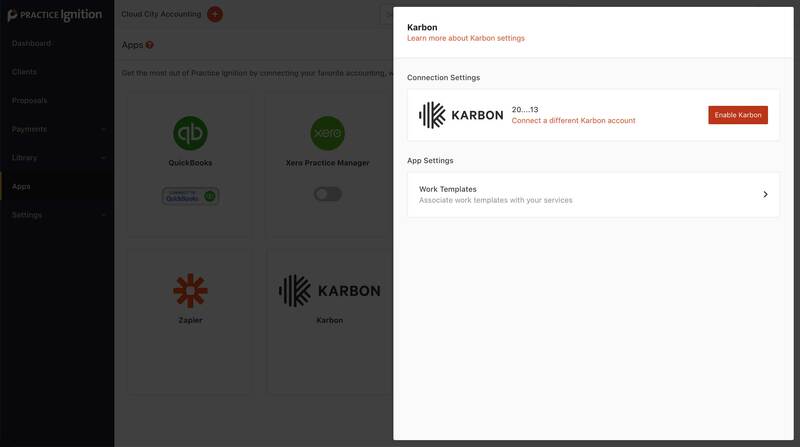 It's a good idea to make sure you have created Karbon templates for each Practice Ignition service before connecting the two Apps. You link Practice Ignition and Karbon together using your unique connection token. Find you connection token in Karbon by going to Settings > Connected apps > Practice Ignition. Within Practice Ignition navigate to the Apps section. Click on the Karbon app tile (only available on Practice Ignition Professional or Scale plans). Within the Karbon settings drawer, enter your API key. These steps will establish a connection with Practice Ignition and import your Karbon templates into Practice Ignition. The integration is not enabled until you complete the the service mapping steps, which are outlined below. Linking your Karbon templates to Practice Ignition services will automatically create a work item from the specified template whenever a client accepts the linked proposal. After establishing the initial connection, click the Work Templates card in Practice Ignition to begin linking your services. Your existing Services are shown on the left, and your imported Karbon work templates are available on the right to choose within the dropdown menus. Simply select one or more templates for each corresponding service. You can leave some services with no associated Work Template, but these services will not create a Karbon work item when selected in a proposal. When done, click Confirm Settings. Once you have connected and linked your services, you are ready to enable the integration. Click on Enable Karbon and the integration will be turned on. How can I import changes to my templates into Practice Ignition? How are contacts linked with the Practice Ignition integration?